After more than four years of constant combat, the artillery still thunders daily in Ukraineâs eastern Donbas region along the 250-mile-long, entrenched front lines of Europeâs only ongoing land war. There, Ukraineâs military remains locked in combat against a combined force of pro-Russian separatists, foreign mercenaries, and Russian regulars. For years, the physical effects of the war have remained more or less geographically quarantined to the Donbas battlefield. This summer, however, Russian naval forces have stepped up their harassment of Ukrainian merchant vessels in the Sea of Azov, effectively blockading the body of water through which roughly 80 percent of Ukraineâs exports pass. âRussiaâs actions to impede maritime transit are further examples of its ongoing campaign to undermine and destabilize Ukraine, as well as its disregard for international norms ,â U.S. State Department spokeswoman Heather Nauert said Thursday in a statement. âWe call on Russia to cease its harassment of international shipping in the Sea of Azov and the Kerch Strait,â Nauert said. In May, Russia opened a bridge across the Kerch Strait connecting mainland Russia to the Crimean Peninsulaâ"a Ukrainian territory Russia invaded and seized in 2014. The Kerch Strait is the only water passageway from the Black Sea to the Sea of Azov. For that reason, all maritime traffic now has to pass under Russiaâs new bridge. With their new bridge complete, Russian officials swiftly moved to limit the tonnage of ships passing through the Kerch Strait. That paralleled a spike in activity by Russian naval forces this summerâ"comprising mostly gunboats, corvettes, and submarinesâ"to board and harass Ukrainian merchant ships in the Sea of Azov. Russia has stopped at least 16 vessels bound for Ukrainian ports in recent weeks, and delayed hundreds of others since April, Thursdayâs State Department statement said. Some Ukrainian officials warn the Russian move this summer could escalate the ongoing land war. âWe see this being done to block the Ukrainian ports in the Sea of Azov, to escalate tension, and possibly to conduct a military operation, attack Mariupol that exports ferrous metals, as well as attack other ports of the Sea of Azov,â Ukrainian President Petro Poroshenko said in July. Franklin Holcomb, a researcher specializing in Russian geopolitical affairs at the University of Tartu in Estonia, says Russiaâs military operations against Ukraineâs merchant fleet in the Sea of Azov have two primary objectives. The first, Holcomb said, is to undermine the perceived strength of the Ukrainian g overnment in the eyes of Ukrainian societyâ"an ongoing effort by the Kremlin since Ukraineâs 2014 revolution sent the post-Soviet country on a Western trajectory. Second, Russia aims to âassert control over the occupied Crimean Peninsula and its surrounding waters and thereby lay the groundwork for similar aggressive actions in the Black Sea region,â Holcomb told The Daily Signal. Only Russia and Ukraine have coastlines on the Sea of Azov. Since April 2015, Russian harassment of Ukrainian maritime traffic in the Sea of Azov has stymied the flow of trade at Ukraineâs most important ports on the seaâs coastline. Maritime traffic in the Ukrainian port city of Mariupol has dropped by 15 percent, and the port of Berdyansk has decreased by one-third, Ukrainian officials report. Russia has effectively taken control of the sea-lanes in the Sea of Azovâ"a move tantamount to a military blockade, some Ukr ainian military experts say. âItâs an unfolding aggression that weâve seen in Crimea in 2014, and then in the Donbas,â said Oleksandr Khara, a former Ukrainian diplomat who is now deputy chair at the Black Sea Institute of Strategic Studies, during an interview with the Ukrainian news agency Hromadske International. âSo, the Russians are connecting the theaters of war in Donbas and Crimea by making this blockade of Ukrainian Azov Sea ports and stopping international vessels from shipping goods to and from Ukrainian cities,â Khara said. Also, according to a 2010 U.S. Geological Survey study, there are an estimated 218 million barrels of recoverable crude oil and 4,093 billion cubic feet of recoverable natural gas in the Sea of Azov. These reserves have not yet been tapped by either Russia or Ukraine. Russian President Vladimir Putinâs approval ratings are currently under pressure due to unpopular pension reforms in Russia. Consequently, some in Ukraine worry that a manufactured crisis in the Sea of Azov could be a way for the Russian president to divert attention away from domestic issues onto yet another foreign military adventure that plays well to Russian nationalism. Some observers point to the precipitous rise in Putinâs domestic approval numbers after the 2014 invasion of Crimea as a bellwether for the sort of military operation Putin might undertake if he feels his political future is shaky. Ukrainian troops along the Sea of Azov coast say theyâre preparing for a Russian amphibious invasion. The Kremlin, for its part, says its growing naval presence in the Sea of Azov is only meant to defend its forces in occupied Crimea, as well as the Kerch Strait Bridge. Altogether, Russiaâs naval presence in the Sea of Azov comprises only about 1,000 attached marines, Ukrainian military officials say. In the eyes of many military experts, thatâs not enough to conduct a major amphibious assault in the near future. On Wednesday, however, Ukrainian Defense Ministry spokesman Dmytro Hutsuliak said that Russia, âunder the guise of combat readiness training,â was stockpiling weapons and stepping up training activities for its military units along the Sea of Azov coastline. There are about 40,000 Russian troops currently deployed to Crimea, Ukrainian military officials say, and the Russian navy has about 40 ships assigned to the Sea of Azov. 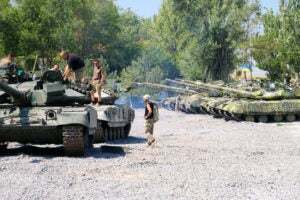 âRussia, of course, might increase pressure in the wate r area, but then local hostilities will break off, which could provoke a deeper version of hostilities and eventually grow into a large-scale war,â Ihor Romanenko, a former Ukrainian army lieutenant general and ex-deputy chief of the General Staff of the Armed Forces of Ukraine, wrote in a July 18 commentary for the Ukrainian news site UNIAN. The operative, Minsk II cease-fireâ"signed in February 2015â"has effectively frozen the war in Ukraine along its current geographical boundaries. Yet, the war never ended. More than four years after the war began, one Ukrainian soldier still dies in combat roughly every three days. And civilians frequently die, too. Sometimes caught in the crossfire of the artillery or the snipers. But most often these days due to land mines. So far, the war has killed more than 10,300 Ukrainians. On Aug. 23, five Ukrainian soldiers died in combat with another seven wounded. 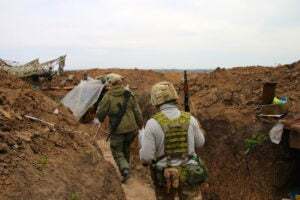 And on Aug. 24, Ukraineâ s Independence Day, a 35-year-old father of two was killed during an artillery attack by combined Russian-separatist forces on the village of Vrubivka, within Ukrainian government-controlled territory. The attack damaged civilian homes and a school, Ukrainian officials said. Itâs an absurd war, really. Neither side is fighting for a breakthrough or to take new ground. Basically, itâs a long-distance artillery standoff in which the opposing armies weather the daily shelling from within their trenches for no more concrete of an objective than to just not be the first side to back down. At its pleasure, Russia has maintained a cycle of waxing and waning violence by flaunting the Minsk II cease-fireâs rules. The war remains a tool for Moscow to destabilize Ukraine and forestall its Western pivot, Ukrainian and Western officials say. The southern terminus of the front lines is in the beach resort town of Shyrokyne, just outside the city of Mariupol on the Sea o f Azov. So-called separatist territory comprises about 20 miles of shoreline on the Sea of Azoz, running roughly from the outskirts of Shyrokyne to the Russian border. During the years of heavy fighting for Shyrokyne there was never a serious attempt by either side to flank their enemyâs trench lines with an amphibious landing. Ukrainian troops said they occasionally went on amphibious raids. Sometimes they used small rafts. Sometimes they simply swam. Yet, there was never a massed amphibious operation. Russiaâs aggression in the Sea of Azov this summer threatens to upheave the warâs uneasy status quo. Now, Ukrainian military officials are looking at ways to boost their ability to protect their merchant fleet as well as to repel an amphibious invasion by Russian forces. Russiaâs 2014 takeover of Ukraineâs Crimean Peninsula left 80 percent of Ukraineâs navy in Russian hands. Rather than replace the blue-water warships lost in Crimea, however, Ukrainian military leaders have since prioritized the creation of a âmosquito fleetâ of littoral craft, armed with advanced anti-ship weapons. The Ukrainian trenches in the coastal town of Shyrokyne, on the southern terminus of the front lines in eastern Ukraine. On Wednesday, a top Ukrainian naval official said Ukraine was boosting its military presence in the Sea of Azov to counter the Russian threat. With that goal in mind, Ukraine has already launched production of its own $30 million, 54-ton, Gurza-class artillery cutters, able to operate in the shallow draft conditions of the Sea of Azov, which has an average depth of about 30 feet. Ukrainian news age ncies have reported that the Ukrainian navy has asked for 20 Gurza patrol boats by the year 2020. Ukraine is also developing new weapons for maritime combat. On Aug. 18, Ukraine successfully tested a new anti-ship cruise missile called the Neptune. Designed and built in Ukraine, the Neptune can hit targets about 200 miles away and sink warships with displacements of up to 5,000 tons, Ukrainian defense officials say. The spectre of a Russian amphibious landing has also influenced the posture and training of Ukrainian military forces in the Sea of Azov region. 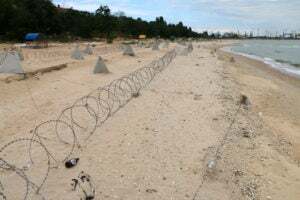 Along the Sea of Azov coastline, Ukraine has built a network of coastal defensesâ"in some places they look like something from a photo of Normandy in World War II. Also in the region, Ukrainian tanks have been conducting live fire drills with sea targets. And soldiers in the Ukrainian National Guardâs Azov Regiment, which is based in the town of Urzuf on the Sea of Azov coastline, say their trainin g is focused on repelling an amphibious invasion force. âAltogether, Ukraineâs military is adequately preparing all forces available to repel possible aggression, in connection with the escalation in the Azov Sea,â said Romanenko, the former Ukrainian general.